TALIA is a Singer/Songwriter from Adelaide. She grew up surrounded by Musicians, but she battled anxiety and was too nervous to let anyone hear or see her sing. After the traumatic loss of her Mum in 2007 to Cancer, TALIA promised herself that she would finally let her Mum hear her sing, through releasing songs via the internet. This period of grief in TALIA's life led her to unlock the strength to share her voice and story through Music. In 2016, TALIA decided to apply for The Voice. 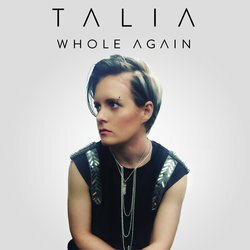 TALIA had never performed Live before in front of an audience, but she turned the chairs of The Madden brothers at her Blind Audition after singing Sarah McLachlan's 'Angel' as a tribute to her Mum and joined Team Madden as one of their Top 12 Artists. TALIA proceeded to make it to the Super Battle Round. Since her time on The Voice, TALIA has hunkered down in the studio and focused on her song writing. The result of which are some powerfully emotive, honest songs about Love, heartbreak, betrayal and survival. Her debut single is titled 'Whole Again' and is available now with her second single 'War On Love' out soon! A powerfully emotive song about finding love only for it to be destroyed by the betrayal of a partner and the deep despair and longing of wanting to feel Whole Again.